Everything Satan does is aimed at destroying your fellowship with God. Not only will he use sin, but he will also use deceit and lies to get you to believe something other than the truth. In this passage we are given practical guidance on how to stand strong against the schemes of our active enemy so we have authentic faith and love. If you like these notes, right-click to download and save them. 2. A life committed to Christ will never come back counterfeit. Well, what an Easter season! We saw hundreds of new faces on Easter, over 1,100 people in attendance that day and the Gospel clearly shared. We’ve seen two new salvations in the last month! Praise be to God. We want people to know this Jesus that we know and adore. If we go on just talking about Jesus in here, but not to the world out there that desperately needs Him, we fail. The beginning of this year we studied the first part of 1 John and the necessity for us to have authentic faith in Jesus Christ. Faith in Jesus Christ is the very thing that reconciles us to God, but without love, that faith is meaningless. The man who went from Christian hater to Christian lover, the Apostle Paul, said, “If you have great faith, sermons, words of angels, but have no love, you are just an annoying person.” Our calling to faith should transform us to be people who love with our whole heart. True saving faith in Jesus Christ will enable us to love the unlovable and reach those who are unreachable. The love of Jesus Christ was not some fake or forced love, but it was as sincere as it comes—even when it cost His life. Our call to faith is not some call to believe a nice message that makes us feel better about ourselves; rather true faith transforms our love into a lasting love that is unmistakable to a loveless world. Yet, we don’t always put our faith in to action. We fall flat when it comes to letting a desperate world know about the faith we have in Jesus Christ. 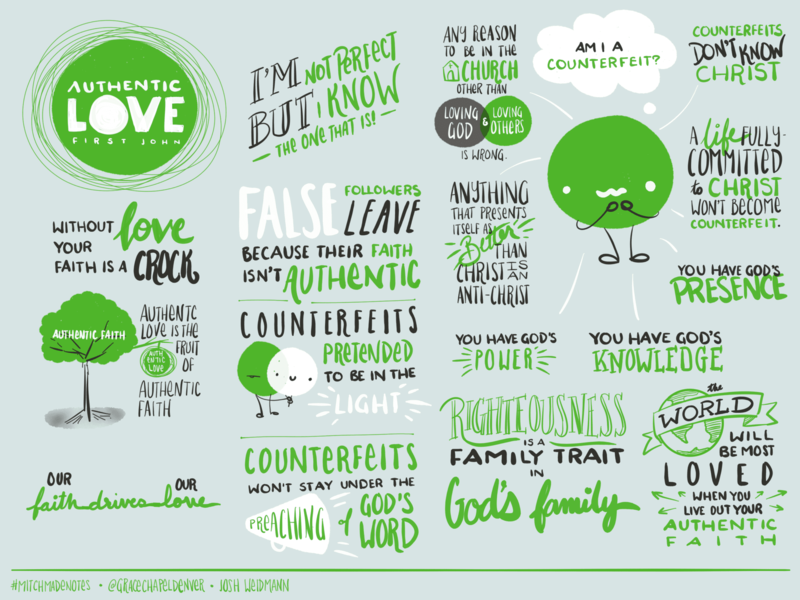 For the next two months we are going to finish our study on 1 John in a series called Authentic love. Last Sunday I attended your church and I heard your preacher. When he spoke he said everyone and sinned and turned away from God. Because we rejected God we all face eternal separation from God. But then he said that God love us so much that he sent his Son, Jesus Christ, to reconnect us with God and forgive us of our sins. All we have to do is believe in Him and we will go to Heaven and live with God forever. My parents recently died. I know they did not believe in Jesus Christ. So if what your preacher said was true, they are damned to hell. After being with you, I am convinced that either you yourself don’t believe this message, or that you don’t care. We have live only three blocks from your church my whole life, and no one ever told us about your Jesus. Sadly, that could be said of us in our homes, neighborhoods or even by the people who live across the street in these apartments. If we only have faith, but we lack love, we’ve missed the message of Christ. So how do we avoid inauthentic faith? You avoid being a fake by having authentic faith. I will give you three ways to apply this, but you have to understand that genuine love starts with genuine faith. Millennials, you know this, but if you see someone who is fake—or you enter a place that feels forced or sleek, you grimace and want to get out. Most people don’t like the used car sales men, I will tell you anything you want to hear to appease you, kind of love. We want the truth; tell me as it is. Love me for me, not for any other surface reason. So to have authentic love, you must have authentic faith in God who is love. Children, it is the last hour, and as you have heard that antichrist is coming, so now many antichrists have come. Therefore, we know that it is the last hour. Context is important here. Remember what John was just speaking about in Chapter 2: He had told them that Christ enough for them to be sure they have a relationship with God in verses 1-6. Then in verses 7 through 14 he tells them to love one another because they had been so deeply loved by God. And in 16 and 17 he tells us all to avoid loving the world. Now he comes to verse 18 and is saying, “there are some who are going to try to get you do to the opposite of everything I just told you to do. The message is that if you want to stray true—avoid being a fake—you must be aware that there are going to be people who are “Counterfeits.” They will present themselves as good and from God, but they are tools of the devil to pull you way from Christ. He is saying, Counterfeits are Satan’s way to trick you. John even clearly states his purpose in writing this section in verse 26, “I write these things to you about those who are trying to deceive you.” He loved them and didn’t what them to be deceived, tricked or pranked. The other night I was eating burgers with my 3-year-old niece. One of my favorite things in the world is to make her laugh because she has this petite little voice but her laugh is a deep and guttural 500-pound smoker from New York. So I would do something to make her laugh and then she would say in a cute voice, “You pranked me uncle Josh.” Her 11-year-old brother corrected her every time, he didn’t prank you, he was joking with you. So then we have a deep philosophical debate with a 3, 4 6 and 11-year-old about what it meant to prank someone. We determined that a prank was more mischievous than a joke; as the dictionary defines it, a prank is out to manipulate someone who doesn’t know they are being tricked. As we determined this I told little Mac, I will joke with you, but I will never do anything to intentionally hurt you because I love you. Yet, John is saying, there are some who don’t love you… or God. So they prank you, manipulate you and spin you to get you to believe something other than the truth. John’s point was that time was too short to be believing a lie of the enemy. The way that John and the Apostles viewed the world was that the Messiah has finally come. The finish line for the world was going to be crosses at any minute. God had done so much to care for and lead his people to the point of Jesus coming, that they didn’t have any thought that there would be a long time after Christ. Anytime we see the Bible use the term, “The last days” we know this refers to the time between Christ’s first and second coming. He came. He died. He rose again… and he left to only come back to get us all soon. The apostles thought they were in the last days of earth. For that reason, John write “It is the last hour.” Their end times theology believed that the world was coming to an end and there it would not be much longer before Christ came to conquer all. The great thing that we can learn from them is a readiness for God to do his final work. Even though there were thousands of years after the apostles, John is saying “now is the time…be ready!” Yes, two thousand some odd years has passed since then, but we don’t know the time or the hour of Christ’s return, so we live always readying ourselves. Just as they were living in the last hours so are we, yet we must have the anticipation of the apostles. Our excitement and intentionality should be heightened. The point is this, Counterfeits are never real even though they look like it. There will be some who even consider themselves one of us but they are not. There was not political correctness here; no spin or easy words. John just calls it as it is—there were some that were with us, but because they left us, it is clear they are not of us. They fact they couldn’t stay the course and follow Christ in fellowship with His church proves their fickle faith. However, if their faith was genuine, they would have continued with us. This implies that those who have genuine saving faith in Christ do not back away from that ever in their lives. Pseudo-Christians will not stay under the preaching of the Word of God. Their departure is their identification. Perhaps there are some who joined the church and their reasons were wrong to begin with. Maybe some joined just to deceive others. Some joined because it seemed like the popular thing to do. Other saw it as a way of wielding power and popularity. Any reason we join and stay in the church other than to Love God and love others is wrong. A loyal and trustworthy follower of Christ understands that the are in the church to love God more, no matter the cost or payout. Jesus told us about those who are antichrist and how they will come looking gentle, caring and like a sheep. But on the inside the are vicious wolves (Matthew 7:15). On a particular just over a month ago, I was in the kitchen making coffee as the Today Show was on in the family room. I heard them say something like Today we are going to talk about a woman caught in one of the fasting growing cults in the world and see how it has torn apart her family. That lead pulled me in. First, I was surprised that the Today Show said they were going to talk about a “Cult.” That didn’t seem very politically correct; nothing is a cult these days—that is too negative, we don’t call things that, but they did. Second, I was surprised the were going to show a family being torn apart because of religious beliefs. I literally stopped what I was doing to stand by the counter and listen to the story. It was fascinating. They interviewed a set of parents who claimed their daughter had joined a cult. They explained that she was raised Christian but when she reached her twenties, she joined this cult and turned her back on her family and her faith for good. The parents told their heart wrenching details of calling their daughter on holidays and birthday to let her know they loved her, but never receiving a word back. Then they mic’d the parents and went with hidden cameras to find this girl. When the parents found her, she would not speak to them. She didn’t even get out of the car or role down the window all the way. I was crying as the mom stood there begging for a relationship with her daughter, yet her stone-hearted daughter pushed them out and said she had given her life now to follow the new Christ—a Korean woman who, by this girl’s own words, was God now coming in the form of this woman and walking the earth just as Christ had done 2000 years ago. I wrote to the Today Show to ask for a copy of this controversial story, but of course they would not release it and no matter how much I ask, they have ignored my request. It was never posted on their website; it was never made consumable to the public. AS the reported told the story of the parents, and then showed the hidden camera confrontation with the girl, he then explained that he wanted to interview someone from the cult to get their perspective. The cult agreed and set up the interview, to his surprise, the women they assigned to the interview was this girl! She explained the stance of the cult to the reporter, and then he divulged that he had interviewed her parents. He asked her if she wanted to say anything to them and instructed her to look right in the camera and speak to them. She just began weeping. She said she missed them and her eyes as she looked in that camera lens, she looked so distraught and torn apart. It was gut-wrenching. That interview prompted me to do my own study of this cult. Everything the Today Show reported was true; it is one of the fastest growing cults in the world called the The Worldwide Mission Society Church of God. 3 Branches here in Denver. Anything that presents itself as better than Christ is anti-Christ. The “Antichrist” is only mentioned two times in the New Testament, both times are in today’s passage: verse 19 and 22. We know from John’s writing in Revelation that just before the world ends, there will be one great antichrist (Rev. 13; 19:20; 20:10). We may not know what this will look like exactly, but we understand the concept of a rising evil force that we must stand strong on the face of. We are not afraid if we have Christ, we are just ready and on the defense against whatever is thrown at us. “Antichrist” is against Christ (which is to deny him as Lord) or an imitation of Christ (which is to distract from Him). A true counterfeit can be either or both. The are many. The Bible is clear what an Antichrist is–anyone who denies that Jesus is the Christ and that God is the Father. No one who denies Christ has fellowship with the Father. So if someone is to say, I don’t have a relationship with Jesus but I do know God, wrong. You can’t—Jesus and the Father are one, to deny one is to deny the other. That why any cult that denies Jesus as Lord is not a true sect of Christianity, even if they say they are. We have one God the Father and one Son, Jesus Christ and both must be embraced to receive the Holy Spirit. (trans) I’ve quoted 2 Timothy 3:5 to many people because I believer there are counterfeit people in the church today—even in our own backyard—who should be avoided. That passage says this, that such people “[have] the appearance of godliness, but denying its power. Avoid such people.” They are fakes! And for all intents and purposes, we should avoid being such people. How? Here’s how. A life committed to Christ will never come back counterfeit. If you are all-in had have Jesus as Lord, not just “walking with your mouth, but walking with your feet” as my friend says—putting your words and beliefs to action—then you will be fully committed to Christ. That commitment will drive you to confidence in the one true God and help you live out authentic love. What drives that commitment? First it comes from realizing that You have God’s presence you can see that in verse 20, 25 and 27. Look at verse 20 first: But you have been anointed by the Holy One, and you all have knowledge. To Be anointed by the holy one is to be filled with the Holy Spirit. In the Old Testament they would anoint with oil as an outward sign of an inward transformation. King David was anointed in 1 Samuel 16 to show that he had the hand of God on His life and God’s selection of him as King. It was a sign of God’s presence which played out in God helping, supporting, loving and never leaving them. When this passage says “You have been anointed by the Holy One” it could be read as you have been given the Holy Spirit by the Father and the Son. When a person becomes a Christian, he or she are giving the Holy Spirit. This Holy Spirit is our seal that God’s presence is with us; He is our help, comfort and peace; The Holy Spirit instructs us and the Holy Spirit helps us communicate to God and for God to communicate with us. The anointing directs us to the truth, which is Jesus. John 14:6 says that Jesus is “The way, truth and life” without the help of the anointing or the Holy Spirit, we would struggle to find that truth. Jesus knew we needed this Spirit to do even greater things in us and to teach us what we would need to be taught over our lifetime. The Holy Spirit is willing and able to guide us each and every day, we just must be open to His leading. The Second thing that drives us to confidence in Christ and keeps us from being a counterfeit is that we have God’s knowledge. John wasn’t saying they knew everything. John is obviously teaching them himself, so what does he mean that they have no need that anyone should teach them? He means that there is no need for them to go find new teaching that adds to the message of the Gospel they have heard from the beginning. The Gospel is enough! Don’t chase after new things when Jesus is all you need. Jesus and the Holy Spirit is the final authority. The Holy Spirit will help us discern what is an error and what is truth. There are moments I believe when we will be able, because of the Holy Spirit in us, to say “I think that may be unbiblical” or “I think that may be extra-biblical” and we need to be careful. This takes confidence and trust in the Spirit’s prompting. It also requires that you believe in the Gospel and God’s Word fully. What you have head from the beginning is the Gospel message of Jesus Christ. John is making it clear that this is the same message, not a new one or something added. The fact that Jesus is the Christ is the message they must accept. It is important that we grow in our knowledge of the truth and deepen our understanding through careful study and to teach the truth to others. No matter what we learn, we must always cling to the basic Gospel we have head since the beginning. Jesus will always be God’s son and the price that he paid for our sins will always be enough to save our soul. Any new truth we ever learn should go hand-in-hand with the Bible; it will never contradict it. If the Word does not abide in a professing Christian, he will eventually drift from the truth. We have the power of God in us when we abide in Him. Abide in him to avoid shrinking shame and to increase our confidence (28). When we are in Him, we become like Him—not counterfeit, not a fake, but authentic in love and faith. Verse 29 says that the righteousness in our life is the fruit of Christ in our lives. Listen, I want to be like Jesus so I came be with Him; I want Him in my life. In John 8:31 Jesus said, “ So Jesus said to the Jews who had believed him, “If you abide in my word, you are truly my disciples.” I want to be a true disciple, not counterfeit. By staying true to Christ, we will not be easily swayed by false doctrine. When He comes again, we will not shrink in shame, as John says, when he comes again. Obedience and assurance make the fact that Christ is coming again a joyful anticipation. We can’t wait to see Him; we aren’t scared of that day. Our true faith is the results of right doctrine. Verse 21 says, “You know the truth…” and verse 25 says don’t forget it, don’t miss the promise of God to you; “ And this is the promise that he made to us—eternal life.” Our joy, hope and pleasure is to follow Christ and avoid the antichrist. When we know our identity in Christ, then we long for purity morally, ethically and theologically. John ends to say (v. 29) if you are truly committed to Christ, your life will tell that story. It is one thing to testify that we know Christ and are in Him; it is quite another to have a life that reveals that He is our righteousness. We recognize other believers by their lives, not their lips. Righteousness is a family characteristic, in the Father and His children. Growing up as a pilot’s kid, I heard a lot of flying stories from my dad. He flew C-130’s for the Air Force. If you were in the cockpit of a plane with him at lift off you may have heard him call out at some point, “Go, no go” which means you’ve passed the point of no return. You have to take off or you’ll crash at the end of the run way. As the airplane accelerates, the pilot must decide if the plane is moving fast enough for a safe takeoff. Before the flight, the desired speed is calculated based on air pressure, temperature, speed of the wind, and weight of the aircraft, etc. My dad would held the throttle down to reach that predetermined speed. Only before the “Go, no go”is called. After the pilot says, “GO, no go” the plane must take off, there is no going back; it is safer to take off at that point than to try to stop it. Listen, some of you have gotten to the “Go, no go” point in your faith but you aren’t taking off. You know what you need to know and you have the faith you need to have, buy your life looks like a counterfeit b/c you’re not living it out. Some of you are tooling around the airport, playing the game of Christianity and not realizing the necessity to take off and living life to the fullest. 1 John is a call to authentic faith so that you can have genuine love. It’s “Go, no go” time. Are you all in? Or are you acting like a fake?